WASHINGTON — Here’s a controversial issue that won’t go away: Where to hold the 9/11 trial. 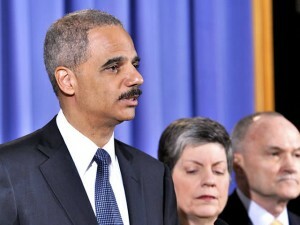 Attorney Gen. Eric Holder Jr., who has often been treated like a pinata by Republican members of the Senate Judiciary when confronted about the issue, says the government is “close to a decision” on how to try Sept. 11 mastermind Khalid Shaikh Mohammed and his fellow co-defendants, the New York Daily News reported. “We have been working on it, and I think we’re close to a decision,” Holder told reporters. “The trial should not and will not be in New York,” added Sen. Chuck Schumer (D-N.Y.), the News reported. Posted: 11/11/10 at 9:05 AM under News Story.